We are conveniently located midway between Baltimore Pike and MacDade Blvd., just off Oak Avenue in Aldan, Delaware County, just six miles from Exit 3 (Media/Swarthmore) of the Blue Route (I-476). We are a five minute walk from the Primos station of SEPTA’s Media/Elwyn (formerly R3). 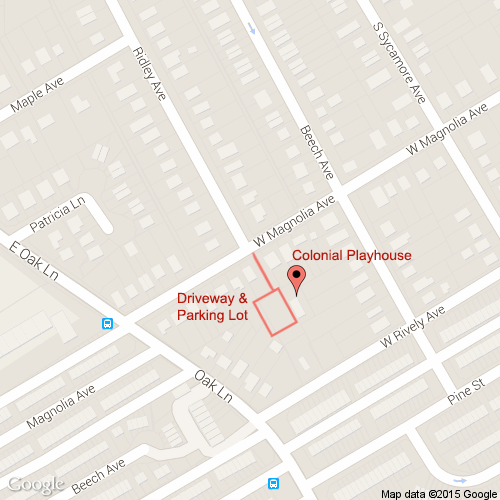 The theatre is in a residential neighborhood and can be tricky to find. The entrance to the theatre looks like you’re going into someone’s driveway. Follow the Blue Route (I-476) to Exit 3 (Media/Swarthmore). If you are coming from the North (southbound), make a left off the exit onto Baltimore Pike. From the South (northbound), bear right off the exit. Follow Baltimore Pike for approximately 3.2 miles, through Springfield and into Clifton Heights. You will cross Route 420 in Springfield just a mile or so after leaving the Blue Route. The major landmark which will let you know you are getting close is the Home Depot shopping center just past the intersection of Baltimore Pike and Bishop Avenue. The shopping center is on the right side and is set somewhat lower than the road level. There is also an Acme supermarket in that same complex, as well as a Modell’s Sporting Goods Store. As you pass the Modell’s, the road begins to go up an incline, at the top of which is a Burlington Coat Factory. You should be in the right lane, as the next light is Oak Avenue. Turn right at Oak Avenue and drive about 1 mile. You will pass through several closely-spaced lights and cross some railroad tracks and pass the Giant Supermarket. The next light after the tracks is Providence Road. Cross Providence Road and pass three streets on the left. The 4th street is Magnolia Avenue. You will see the “Club Secane Apartments” sign on the right. Directly across from this sign is Magnolia Avenue. Turn left on Magnolia Ave. and go one block to Ridley Avenue, which would be a left turn. Turn right into the Colonial Playhouse entrance. If lot is full, park on the street. From I-95 South, get off at the Bartram Avenue exit. Coming over the Platt Bridge, take Island Avenue (North – bearing around right), go under I-95 and make a left turn at the first light. This is Bartram Avenue. On Bartram, turn right at the first light (at the intersection of the airport employees parking lot). This is 84th Street. 84th Street crosses Lindbergh Blvd. at the Delaware County line and becomes Hook Road. Stay on Hook Road until you get to Primos Avenue. A good landmark is about one block before Primos Ave. you’ll see a “Pacific Pride” gas station on the right, which is a commercial fueling station where there isn’t an attendant’s booth. The sign has a lot of yellow and orange in it. The right turn onto Primos Avenue is a that veers up and to the right. Go up and over a bridge, down the hill, through a light and up over another bridge, down and then through a slight “S” curve (bearing left). After the “S” curve the road changes to Oak Lane/Avenue. The next intersection is Chester Pike. Cross Chester Pike, then cross MacDade Blvd. Go about one mile up Oak. Two streets after the first light, you come to Magnolia Avenue. Club Secane Apartments complex is on your left. Turn right on Magnolia and go one block to Ridley Avenue, which would be a left turn. Turn right into the Colonial Playhouse entrance. If lot is full, park on the street.